We have worked over the year on a software tool that would help our clients to easily build up their own stand or show design from aluminum trusses. Our long -term work paid off and our TAF TOOL software is here. You can easily download it on this website and start getting your first experiences working with it right away. 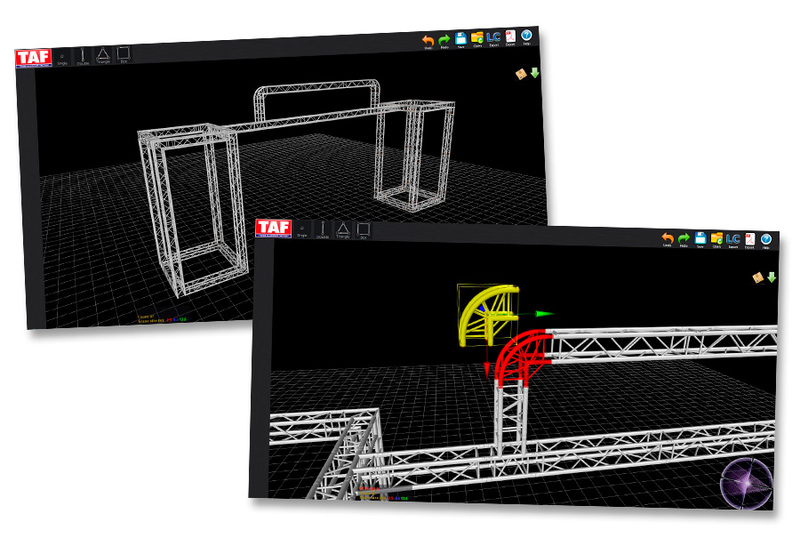 As you can see in the video the TAF TOOL software gives you realistic 3D working space. The individual trussing systems library has ready to use all the standard parts available in the chosen system copying truly the real dimensions of every trussing segment. It is possible to zoom in/out to view details or to get overall view of the design. You can rotate the camera to basically any point of view so you know how the structure is going to look like from various angles. You can save the unfinished project and work on it later. Once you are done with the design, there is a possibility to export your project to PDF file which shows the list of parts that were used, the design itself and its real dimensions. There is no tool like a TAF TOOL. Let's get started.